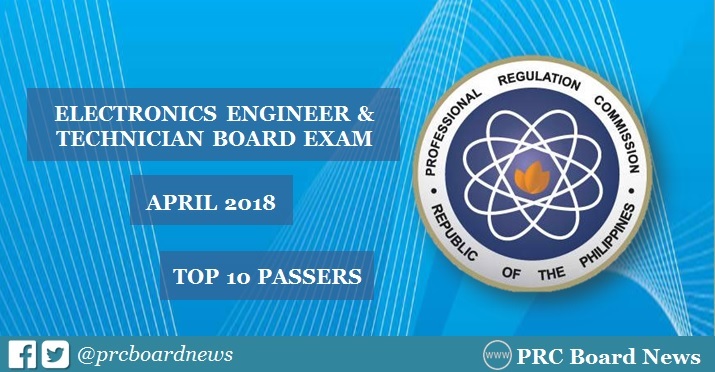 MANILA, Philippines - The April 2018 Electronics Engineer (ECE) and Electronics Technicians (ECT) board exam top 10 or topnotchers including other results - list of passers, top performing schools and performance of schools are released online on Thursday, April 12 or in three (3) working days after the exam. Mark Eullysis Dando Alzaga from Far Eastern University (FEU) - Institute of Technology aced the ECE board with 93.30%. It was followed by Angelo Marion Poblete Conwi from Technological Institute of the Philippines (TUP) - Manila, 91.40%. The Professional Regulation Commission (PRC) administered the licensure exam in the cities of Manila, Baguio, Cagayan De Oro, Cebu and Davao on April 4 and 5 for ECE and April 6 for ECT board exams. In April 2017 exams, Aaron Maca-ayong Polancos from Mapua Institute of Technology (MIT) - Manila led the ECE board exam with 88.80%. It was followed by MIT's Francis Amarille Bautista and Gerard Ely Ucab Faelden from De La Salle University (DLSU) -Manila, both having 88.30%. Joseph Alexander Philip Zaldarriaga Lacson from University of Saint La Salle (USLS) and Joshua Maurice Fabillar Plameras from MIT-Manila were the highest placers in the April 2017 ECT board exam, 92.00%. In the April 2016 ECE board exam, University of the East (UE-Manila) alum Paul Esteban Quibuyen topped the list with 89.30%. Robin Mon Rivas Miranda from Polytechnic University of the Philippines (PUP) - Sta. Mesa obtained the highest place for ECT with 94.00 percent grade.